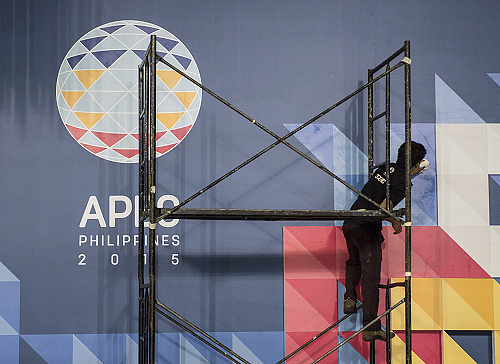 An employee prepares outside the main conference hall for the Asia-Pacific Economic Cooperation (APEC) meeting in Manila, the Philippines. Asian countries will face more economic risks this year, according to the Blue Book of the Asia-Pacific Region: Annual Report on Asia-Pacific Development (2016). The blue book, written by the National Institute of International Strategy at the Chinese Academy of Social Sciences, was published in Beijing on May 4. The blue book covers a range of important developments in the region in 2015, including the Trans-Pacific Partnership, the election in Burma, the 12th National Congress of the Communist Party of Vietnam and the situation in the South China Sea. It also offers an overview of China’s relations with selected Asian nations, such as Japan, South Korea and Indonesia. Asian economic growth has slowed down for the past five years, and this trend is expected to continue in 2016, according to the blue book. With the exception of India, most major emerging economies in Asia are undergoing an economic slowdown. There will be a seesaw effect between Asia’s emerging economies and developed economies now that the US Federal Reserve has abandoned quantitative easing, said Li Xiangyang, editor-in-chief of the blue book and head of the National Institute of International Strategy. This results from the disconnection between global trade and economic growth as well as the reversal of international capital flow, he said. In addition to the seesaw effect, there are short-term risks from declining growth in global trade and the Federal Reserve’s interest rate hike. If the credit crisis in America is the first stage of the international debt crisis and what occurred in Europe is the second stage, it is increasingly likely that the third stage will take place in emerging economies, Li said. To deal with potential risks, Asian nations have introduced economic reforms. The blue book suggested paying special attention to Japan, India and Indonesia, which made breakthroughs in 2015. Last year, India for the first time surpassed China to become the major country with the highest economic growth, and development is expected to speed up further in 2016. In Japan, Prime Minister Shinzo Abe will continue the massive economic project of reflation. However, the effect will remain to be seen, so will that of reform policies under Indonesian President Joko Widodo. Experts who participated in the research said the fundamental way to maintain sustainable economic growth in Asia is to adjust the mode of development. However, the overall reform process in the region is making slow progress and policies differ greatly from nation to nation. Many nations have attempted to reform through government change, which, however, will not necessarily lead to successful reform, experts said. Most nations have failed to address the key problems, and there is no effective way to evaluate the final results of reform, they added.